Chanel CR2017 "Cuba" NWOT Multicolor Enameled Faux Pearl'I Love Coco' Pin. 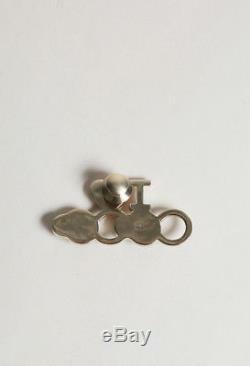 This whimsical, quilted'I Love Coco' pin features faux pearl accented coconut cocktails and an enameled heart with an interlocking'CC' accent. From the Cruise 2017 "Cuba" collection. Fabric Content: Metal, Enamel, Faux Pearls. This item is in great condition. Color may appear differently on varying monitors and device settings. Chicago, Gold Coast: 900 N Michigan Shops, Chicago IL 60611. Dallas: 6805 Snider Plaza, Dallas TX 75205. Minneapolis: 5051 France Ave South, Minneapolis MN 55410. Items must be unused, unworn, unwashed, and undamaged. Please note the following size chart is a general guideline. Size and fit are approximations and may vary across designers. Please send us a message if you have any further questions. What should I do if I never received my package? Next, please send us a message and we will work with the carrier to open an investigation. Please note that if the carrier finds that there was no mishandling of your package, there is no further action that we are able to take. Will my package require a signature? If you would like to find out if your package will require a signature please feel free to reach out our way. How will I know when my order is ready to be picked up? 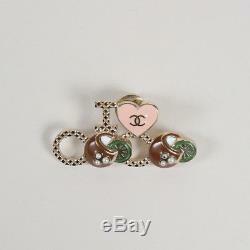 The item "Chanel CR2017 Cuba NWOT Multicolor Enameled Faux Pearl'I Love Coco' Pin" is in sale since Wednesday, May 30, 2018. This item is in the category "Jewelry & Watches\Fashion Jewelry\Pins & Brooches".sale" and is located in US. This item can be shipped worldwide.